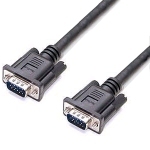 These excellent quality SVGA Male-to-Male (plug to plug) cables use triple co-ax cables together with a double lapped screen (braid and foil). This results in minimum interference and the best possible picture quality. Manufactured to the most recent specifications with 7 data lines. Specifically designed for use in entertainment venues and educational establishments, they bring out the very best in plasma displays and projectors.